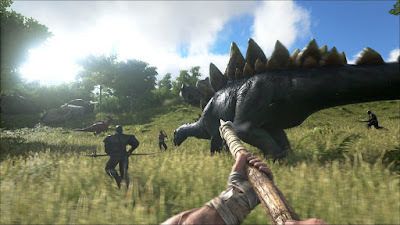 New creature sounds for: Dodo, Raptor, Quetzal, Parasaur, Rex, Trike, Pteranodon, Dilo, Direwolf, Compy, Dung Beetle, Argent, Pachy, and Mammoth. New female/male character sounds, inventory sounds, building sounds, crafting sounds, and a couple items/weapons. Ridable fliers (not the Moth) now have ground attacks. Player invulnerability after Eel attack increased to 5 seconds. Scuba tanks now provide oxygen underwater even when a player is offline. Underwater mines now respect enemy foundation radius. Underwater mines increased damage by 33%, increased targeting range by 100%, increased movement speed by 100%. Cluster grenades no longer fragment if they’ve been destroyed by damage. Vault health and physical size has been decreased. Speed buff gained from Oxygen stat on dinos decreased by 80%. Tek Structures now give appropriate insulation on Scorched Earth. Turrets can now be placed underwater. Underwater turrets will not target anything above water. Maturation Bar, Egg Incubation bar, and Taming bar now also displays the numerical progress percent. Beaver and Thorny Dragon now adjusted to 50% reduction for resource-weight (they do a few) due to being a jack of all trades, as opposed to specialising.